Now that we’ve had a couple of nights’ sleep after a fairly full on rush from Perth we can divulge a bit more about the flight from Lord Howe. Peter, the local aviation historian and Rachael, Border Force, bio security and several other roles, met us early with good advice on getting away in one piece. The airfield and approaches are very turbulent at times and our small aircraft felt very insignificant against the huge cliffs. The departure went well and Lord Howe slipped behind us as we slowly climbed to 10 000 feet. Every half hour we swapped over fling the aircraft and every 100 miles calculated fuel and time to Lord Howe Island, Norfolk Island Cape Reinga and Auckland. At first we had a headwind, then a steady tailwind built, just as forecast (thank you JOMOC and the Australian Bureau of Meteorology). We saw just 2 ships on the whole journey. We were out of radio range for most of the trip, so we relayed messages through airliners, Velocity 110 and Cathay 189; thank you both. Eventually we could see the surfline and the welcome hills of NZ. Another hour south and we were over Auckland. 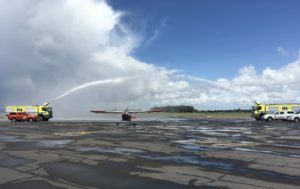 Landing at Auckland International in 30 kts of wind was hard work, but thanks to the team at Sky Care we soon had the aircraft tied down on their front lawn. Thank you all. 1035 miles, 8 hours, 45 litres of fuel remaining, happy team, made it! We’re off again. 3 rapid hops, Perth, Esperance, Forrest then Broken Hill. We’ll cover the hop to Esperance later. From Esperance, we flew along the beautiful beaches of the Cape Arid National Park, then across the red, arid desert to Forrest. The airfield is run by Lee and Ilsa. Their welcome and hospitality was amazing. Quickly refuelled, we tucked the aircraft in the hangar, built in 1929 to help service the aircraft connecting east and west Australia. The airfield itself was sealed and used by RAAF and USAAF aircraft during the Second World War. Now it is a critical staging post for RAAF and civilian aircraft flying east west or deeper into the outback to the north. The airfield is supplied by train once a week and has several aircraft drop in each day. Our accommodation was the old school house, converted into a lovely 3 bed house with history. Lee and Ilsa took us to see a majestic eagle’s nest, hosted a great dinner and chatted over beer about travel and adventure. We were joined by Graham and David, flying a much faster Cirrus in the opposite direction. A meeting of travellers. In the morning we followed the 297 mile long straight railway track to the east, passing several sand airfields used to get people in to mend track and repair broken locomotives and wagons…driving somewhere takes forever out here. The scale of the country and the challenges faced by the pioneer explorers and aviators really became apparent to us. The salt lakes could have been an arctic tundra vista from our height; what a country. Arrival at the historic mining town of Broken Hill was hard. The sun was setting directly down the into wind runway making it virtually impossible to judge height, so we changed to the sand cross runway. Despite teaching people to land aircraft many times and emphasising that you must look out the front into the distance, not look down…I looked down to check the surface was ok and promptly arrived, firmly, bounced then landed again. Oh well, any landing you can walk away from is a good one! This photo of a poppy field was taken back in the UK in June, when the airframe had less than 10 hours on it, but comes to mind today as Remembrance Day marks 100 years since the end of the First World War. The expedition aims to commemorate 100 years of the Royal Air Force, and this 3-week pause before we start again in Australia gives time to reflect on the lives lost and sacrifices made throughout this history. Please visit our Fundraising page to help us support our charities RAF Benevolent Fund, RAF Association and Save the Children.